We sprang out of bed even before the alarm. Diana raced to the kitchen, started the coffee and tossed the cereal bowls onto the table. Upstairs, I slathered my face with shaving cream while singing a tune. I nicked myself a couple of times, but, still, I knew it was going to be a great day. I was full of adrenaline, as excited as I'd been for my first day of college, my first job interview, the day we acquired Furniture Consignment Gallery. I didn't need any coffee, but what the heck, we were ready to live dangerously. Diana grinned as she slid a hot cup of java across the table to me. Our eyes locked in a conspiratorial gaze. "We need to focus -" she said. "We can't screw this up," I blurted out at the same time. "Those kids are going back to school," we agreed. "Today!" We exchanged a high five for good luck. Moments later, the boys straggled into the kitchen. Soon, the French toast was flying from griddle to plate. Sure, there was some whining, a few mild curses mumbled under the breath, and the occasional hostile stare from the offspring. But in record time, the boys were fed and out the door. They looked like a trio of turtles trudging down the driveway with their bulging backpacks strapped to their backs. Son #1 was on the bus at 6:55 a.m. Son #2 left at 7:05, and #3 at 7:25. "See you later!" I sang, waving goodbye as the last bus rumbled down the road. Then, I broke into an impromptu and utterly joyful "moon walk" back to the house. Then there were all those last-minute excursions with friends. "Dad, we're going to the golfing range... the ice cream shop ... the pool ... the mall." That was followed by "Can you drive? Can you drive? Can you drive?" When I wasn't a chauffeur, I felt like the clean-up crew trailing after a three-ring circus. I spent the summer turning off lights in empty rooms, flushing unflushed toilets, emptying full bins of trash and clearing a path through the sports gear into the house. I was ready for this moment. Diana gave the boys a sneak peek at their afternoon snack as they walked out the door. She'd baked them a cake. 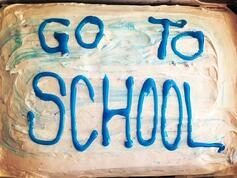 On it, in fresh frosting, she'd written the words GO TO SCHOOL. Freedom! It's wonderful. If the school nurse calls, I'm not answering. Get out," I said firmly. "And don't ever come back." I was shocked - and so was he. In ten years of business, I have never once kicked a customer out of the store. Until now. And, yes, this guy more than deserved it. He approached me at the store one day last week with a question about a "crappy piece of furniture that's seen better days." Actually, the piece was an antique pine cabinet full of vintage charm. Gesturing at it with contempt, he launched into a litany of its imperfections. The doors didn't line up correctly. The lock was sticky. The glue on the dovetail drawers had loosened. "Your price," he said, raising his voice, "is crazy." At this point, I must admit, the guy was starting to irritate me. The imperfections, I told him, are partly by design and partly the result of age, neither of which should be fixed or repaired. Apparently angered by my response, he began insulting me, my business and my integrity. 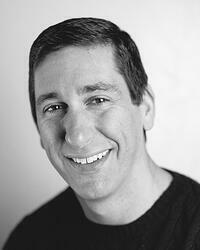 Now, in our business, we see a lot of folks who want to haggle a bit for a better price. In some cases, certain pieces have lingered on the showroom floor too long, and we may discount the price for a buyer eager to take the item home. In other situations, we will demur, knowing that a piece will sell quickly as priced. Our goal is to keep all our customers happy. Our consignors want us to sell their items for the highest price. Our buyers, on the other hand, are looking for a bargain on quality furniture. We walk the knife's edge every day trying to please both. 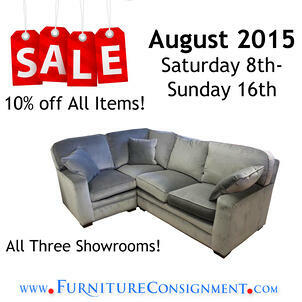 At Furniture Consignment Gallery, we welcome all customers, including the bargain-hunters. If you think there's room to haggle on an item, make us an offer. We'll do our best to help you buy the piece you love at a price you can afford. 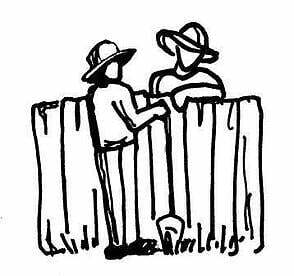 But try to remember: negotiating is an art best done with a butter knife instead of a hatchet. Moments after the moving van pulled out of the driveway of his new waterfront home earlier this summer, she appeared at the front door. Tiny, silver-haired and roly-poly, she thrust out a tray of mouth-watering, freshly-made cannolis dusted with sugar. He had to stop himself from snatching one off the plate, he confessed later. "I comma to say hello," she said in an accent as thick as the day, seventy years ago, that she left the Old Country. "What you eat today? Burger? That's-a no good. I've got meatballs at home. And I wanna you to cut down-a the trees so we can see-a the ocean." An Italian grandma is a force of nature, irresistible and unstoppable. He cut down the trees that week and earned a seat at the family table for dinners on Sunday. He's gained a few pounds this summer much to the delight of his neighborhood nonna. Now, Italian Grandma has decided it's time for him to furnish his new home properly. Out went the shabby recliner, the card-table in the dining room and the old mattress on the floor of the master bedroom. Then, she sent him to us at Furniture Consignment Gallery. Nonna, apparently, knows quality. And she knows a bargain when she sees it. In a whirlwind hour, he found a sectional, a leather chair and a dining room set. (We've got three amazing sets on the showroom floor priced below $1,000.) As he was paying the bill, he was talking about inviting nonna and her husband over to watch a game so he could show off his shopping prowess. "I wonder what she'd bake?" he mused aloud. I felt a pang of jealousy - and I could almost taste the cannoli. "Anybody selling on your street?" I asked. I heard that same question at least three times an hour this week. Our phone is ringing off the hook. What consignors really want to know is whether we can sell their furniture. Are there customers in our showrooms? Do people still want this stuff? We all know that every real estate agent and used car salesman will tell you they are flooded with buyers when the truth is entirely the opposite. Who can you believe? Here's the hard evidence: our movers are panting not only from the heat but from the workload. Rob, foreman of the delivery team, has logged more overtime in July than any month this year. This summer, we've sold more furniture - of every make and style - than any other summer in memory. Hell, yeah. We are busy. Now, for the second question: Do people still want this stuff? We accept the most desirable styles of furniture in good or excellent condition. New, some of the pieces in our showroom would be prohibitively expensive. Say, for example, you covet a set of six armchairs by Thomas Moser. The price new would be around $8,000. 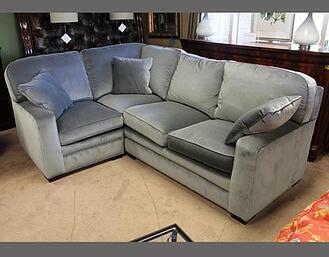 At Furniture Consignment Gallery, we have a set in perfect condition. Price: $3,500. Our three showrooms offer amazing deals like that on extraordinary - but affordable - furniture. So, go ahead, ask the question: do people want this stuff? My answer: hell, yeah. T his week, Furniture Consignment Gallery is going to get busier. Starting today, we're cutting prices on everything by 10%. This means new mattresses, accessories and the thousands of high-end pre-owned pieces in our three showrooms. The sale starts today, Saturday, August 8th and lasts through the tax-free weekend, Sunday August 16th. You could wait for the tax-free weekend, but be aware that the item you covet might be gone by then. Quality furniture, priced to sell, is hard to resist. Are we going to be busy this week? You betcha. On a recent road trip, Diana and I found ourselves trailing a moving van. Twenty years ago, that same company moved us from Kentucky to Boston. Looking back, we had a good laugh thinking about the move. The nicest piece on the truck was a beautiful custom sofa we got by default. Diana, an interior designer, had been working with a difficult client who'd rejected the sofa. So we inherited it. Also on the truck was a family heirloom: a rock-maple bedroom set that had been her father's. After our first son was born, we had it refinished and it's still in his bedroom today. Like many cash-strapped newlyweds, we'd accumulated a lot of household flotsam and jetsam and we gamely dragged all of it with us to Boston. We had a mattress that had been squeezed in and out of many small apartments. I'd hacked the box spring in half with a Sawzall so that we could get it up the stairs to a third-floor walk-up then bolted it back together in the apartment. Ingenious, right? Packed tenderly in bubble wrap was a rickety old brass-and-glass dining set. Diana's family had donated it to us, probably to save themselves a trip to the dump. We didn't leave anything behind: plastic lawn chairs, trashcans, a rusty lawn mower, a dog crate, sans dog. He rode with us in the car like a pampered potentate. We were young. What did we know? We paid by the pound to move our meager possessions, most of which weren't worth hauling past the city limits. That's a lesson worth considering if you are moving. 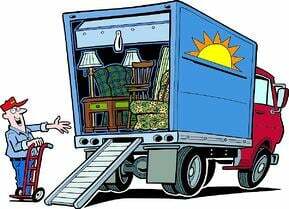 How much will it cost to move your stuff? A lot. My suggestion is to have a yard sale. Sell the old mower and the china cabinet. Get rid of the old mattress. You probably need a new one anyway. Then, stop by Furniture Consignment Gallery. We've got three showrooms full of quality furniture and new mattresses at prices you'll love. Now, that's how you make a fresh start. "Wow!" my sister-in-law said breathlessly. "Amazing!" Her husband was just as awestruck. "Unbelievable," he kept muttering to himself, shaking his head. "Just unbelievable." They were visiting from Cincinnati, and we'd put together an action-packed schedule of the best of summertime Boston, including the beach, some golf, the Duckboats, a tour of Fenway Park, pizza and pastry in the North End and a visit to Harvard Yard. What really sparked their excitement, though, was the sight of our showroom in Hanover, chock full of extraordinary furniture at bargain prices. The two had just moved into a new home in Cincinnati. They needed furniture. So seeing the sights of Boston was actually secondary to the real mission: shopping at Furniture Consignment Gallery. Over the course of the week, my sister-in-law and her husband found the furniture of their dreams in our showrooms. A gleaming mahogany china cabinet by Baker. A Hickory White inlaid sideboard. An entire living room set by Mitchell Gold. In all, the two got about $50,000 worth of nearly new furniture for less than $15,000. Mission accomplished! While enjoying a week in one of the nation's most beautiful cities, my in-laws furnished their house for a fraction of what they would have paid at a new furniture showroom in Cincinnati. Tomorrow, we'll load their furniture onto a rental truck. My father-in-law and my oldest son will drive it back to Cincinnati. And that's probably the best part of this whole adventure. A grandfather-grandson road trip. 900 miles. Four states. A cooler full of snacks. Music on the radio. Time to talk. Priceless. When I was 16, I started driver's ed with a bang. I brought a cocky confidence to my first lesson. "Back out of the parking spot slowly and carefully," the instructor said after I slid behind the wheel and buckled up. I jammed the car in gear, turned around to make sure I wasn't going to run over anyone, and then I hit the gas. The car leaped forward before screeching to a halt. My neck snapped and my heart skipped a beat. "Good thing I have a brake on my side," the instructor said drily. "Next time, Jay, put the car in reverse if you want to back up." Screeching brakes have been on my mind this week. 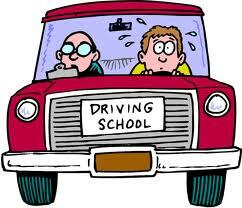 Cade, my oldest son, is about to get his driver's permit. I intend to give him a few lessons myself before we sign him up for driver's ed. After all, it's a rite of passage, a kind of parental EKG, to see if your heart is strong enough to handle the trials of your offspring's adolescence. Fortunately, we have a couple of good places to practice: our stores' parking lots. In a couple of weeks, I'm planning on taking him down to Plymouth - after hours, of course, when the place has cleared out and there's nothing much to damage but my nerves. I hope he doesn't burn too much rubber when he makes those skid marks. In any case, the evidence won't be there long. We're planning on sealcoating and painting new stripes on that parking lot in the next week or two. That means we'll have to close the store for a day. We'll post a notice in the store and on the website so you'll know when that'll happen. We'll steer clear of the store as we're making our slow and careful circles. We've got plenty of inventory inside and I'd rather not have skidmarks in the showroom. We always fought over the top bunk. In fact, I usually started the fight. I was the oldest of the three boys in my family. So my dibs meant the top bunk was somehow more desirable than the bottom. In reality, I didn't want the top bunk. Too hot up there. But conceding it to my brother gave me the imperial mantle of peacekeeper. And then, of course, he owed me one. The bunks were in our camp on Lake Ossipee in New Hampshire. My parents wanted a place where their sons could run wild in the summers. My dad wasn't about to spend his hard-earned money on furniture for three rambunctious boys who were barely housebroken. So he made those beds. Frucci men, by nature, are not exactly patient or exacting craftsmen. My dad picked up a couple of pine boards at the lumberyard, shoved them through a circular saw and drilled a couple of holes for bolts. It probably took all of an hour. "File these," he said and without any more instruction he handed the boards off to me. I took a metal file to the rough edges. Then we stained the wood and assembled the beds. Voila! We boys had something infinitely valuable to fight over for year to come. I slept well in that bunk. I laughed a lot with my brothers. We raised all kinds of Cain. I remember the cool lake breeze and the water lapping against the rocks. When my parents sold that camp years later, the new owners insisted on keeping those rough-hewn beds. Probably knew there was good kid magic in those old bunks. Among the many things I learned from that experience was that furniture has to be functional. People needed a place to eat, sit, work and sleep. Our bunks were sturdy, safe and, best of all from my dad's point of view, cheap. 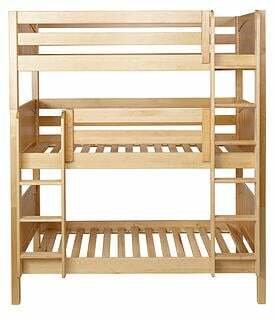 If you're looking for bunks - or any kind of kid furniture built to survive major shenanigans - skip the lumberyard. Stop by one of our three showrooms. You will find the good stuff, made well, at the best prices at Furniture Consignment Gallery. She was stunned. She was just putting the finishing touches on a redecorating project. Window sheers had been ordered but hadn't been installed. And now she was packing up and moving. Only a few weeks ago, someone had lobbed an unsolicited offer to buy her home for a price she couldn't resist. The house had been a sanctuary after a hard divorce. She loved the long gated driveway and the peaceful gardens. Her three girls had lived like princesses there, riding a social merry-go-round through childhood and adolescence. The girls left for college. Now, the brick mansion seemed to echo with loneliness. Selling hadn't been on her to-do list this spring, but the unexpected offer held out the happy promise of a new adventure. So she called Furniture Consignment Gallery. Mitchell Gold had just delivered a living room set. She admitted I was the first to ever sit on the sofa. That, too, went into our truck.Within days, we were at the house filling our truck with treasures including an EJ Victor china cabinet and an extraordinary console table by Dessin Fournir. I asked where was she going. She said she had a temporary apartment, but no firm plans. "Where do you think I would like to live?" she asked. Our moving guys started tossing out ideas: Hingham, Duxbury, Marblehead, Manchester-by-the-Sea. "When you guys are finished," she mused, "I think I'll go for a drive." She's traveling light. No baggage. That's the best way to start an adventure. "Oh, no!" One of our best customers, an interior designer, was in mid-conversation with a staffer when she caught sight of a new sectional across the showroom. "Impossible!" she exclaimed, striding over to examine the piece. "I simply don't believe it." Turns out, she had a history with this particular piece of furniture. Six months ago, she had been working for a couple that had been - hmmm, how to put this nicely? - very challenging clients. They bickered so much during the design process that she felt like more of a referee than a designer. What really broke her spirit, she confessed, was selecting their sectional. Last winter, the trio trekked through the snow to all the furniture showrooms in and around Boston. Every couch she suggested they dismissed as too soft, too firm, too stiff, or too sloppy. Eventually, they agreed on a style. That's when picking the fabric became the new nightmare. They spent endless hours poring over swatches. Finally, the couple settled on a custom tight-back sectional with a chaise and the designer placed the order. Sixteen weeks later, and a dozen or more anxious client phone calls to the designer, the sectional was delivered. The couple had a rare moment of miserable agreement - they just didn't like it. Without telling their designer, they shipped it off quietly to FCG. So here it was sitting in our showroom. The sectional was spotless, stylish, and well crafted with vivid colors. Its price tag was a fraction of what the couple had paid only a few weeks earlier. The designer ran her hand over the fabric. "What a waste," she said sadly. Shortly after she left, a family of six wandered in. Catching sight of the sectional, the teens raced across the showroom and leaped on it joyfully. "Can we get it?" they begged their parents. "It's awesome!" I wish the dejected designer had stayed long enough to see how much this family loved the sectional. All her work and talent were finally being appreciated. I thought it was proof of the old adage: beauty is in the eye of the beholder. Happy people can find it pretty much anywhere.